Plantar is derived from the Latin word planta, which refers to the sole of the foot. Plantar ailments are painful because the sole bears the whole weight of the body while walking. Plantar calcaneal enthesophyte is such an ailment. The Latin word calcaneum refers to the heel. 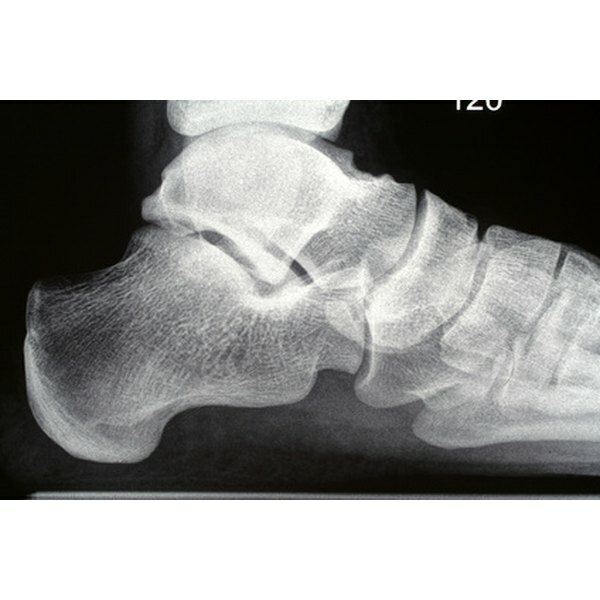 The word enthesophyte combines the two Greek words enthesis, meaning an insertion, and phyton, meaning something that is grown, so a plantar calcaneal enthesophyte is a growth that occurs at the place where a tendon inserts into the heel bone on the bottom of the foot, according to the American Journal of Roentgenology. The enthesophyte growth is osseous or bony in nature. It is popularly called a spur. Enthesophytes typically begin to develop at an enthesis, or point of tendon or ligament attachment. Enthesophytes then enter the tissue of the attached tendon or ligament, according to Arthritis and Rheumatism. Plantar calcaneal enthesophytes occur at the calcaneal attachment point of the flexor digitorum brevis, a muscle that flexes the toes, and the abductor hallucis, a muscle that moves the big toe sideways away from the rest of the toes, according to the American Journal of Roentgenology. They also occur above the sturdy tissue that lines the bottom of the foot and sometimes in this tissue, according to Skeletal Radiology.